If you’re going to buy a Kamado grill it makes sense you want the best Kamado grill. It’s why you’ve searched the internet and landed on this page. 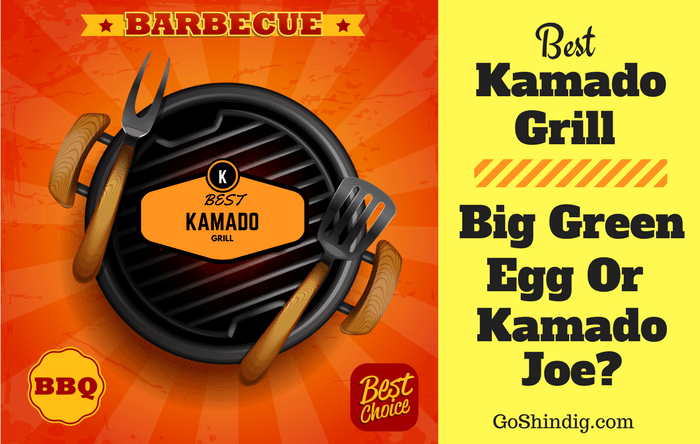 And it’ll be easy for me to simply say the best Kamado grill is… and leave it at that. But I think it’s better you get a well-rounded education into the world of Kamado grilling before you decide to buy. And although I will tell you my top 10 Kamado’s, I’ll also give you the knowledge needed to select the best Kamado to suit your own personal needs and circumstances. Let’s start with a brief history of the Kamado, and it will be brief because today’s Kamado grill is next level compared to its early beginnings, and although there’s no such thing as useless knowledge, knowing how the Kamado became a thing will do little to help you choose the best Kamado grill. Archaeologists have found clay Kamado’s in the ruins of many early civilizations and it’s, therefore, an educated guess to the exact origins of the Kamado. What we know is a version of these clay cookers has been found in India and carbon dated to over 4000 years ago. The best guess is that it then spread through China before finding it’s way to Japan where it picked up the name Kamado – meaning stove in Japanese. Not much changed in the Kamado through the years, in Japan it evolved into a mushikamado to steam rice and in India, it became a tandoor. But all that changed once the Big Green Egg company got hold of it. Not only did they transform the Kamado into something cool to own, but they also made it an all-purpose piece of outdoor cooking apparatus. It grills, smokes and bakes – you can cook almost anything on this beauty if you have the right accessories. So, what is a Kamado grill? As it currently stands, the vast majority of Kamado grills are made from ceramics in a dome-like shape. This dome allows you to enclose what you’re cooking, and with the help of a few air vents, you’re able to regulate the temperature in the well-insulated dome – allowing extremely high and low temps. Now you know what a Kamado grill is I must warn you that this is an extremely long and detailed article. So for those of you that want to know what’s the best kamado grill without reading all of our reviews, I’ve added a top 10 list for your convenience. We first wrote this article on best kamado grills back in 2017 (you can see parts of the review we have removed at the bottom of this article for reference), but a lot has changed in a few short years. So we have updated this article to be up to date with all the greatest kamados as of 2019. 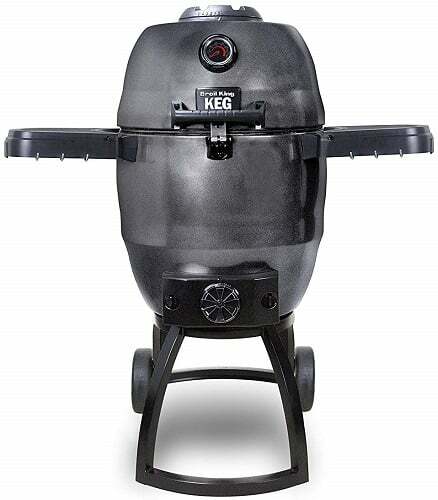 Thankfully we now have many amazing kamado grills in the cheaper price range – still several hundred dollars but not the several thousand dollars people had to pay not so long ago. The latest and greatest in the Kamado Joe range is the Classic III. The Classic II wasn’t even available when I first wrote this article on what is the best kamado grill so you can see how fast this area of grilling has moved. But even then, the original Kamado Joe still topped my list as the winner. What I say next might make me sound extremely biased, so it’s best I state that I am in no way affiliated with the people at Kamado Joe. 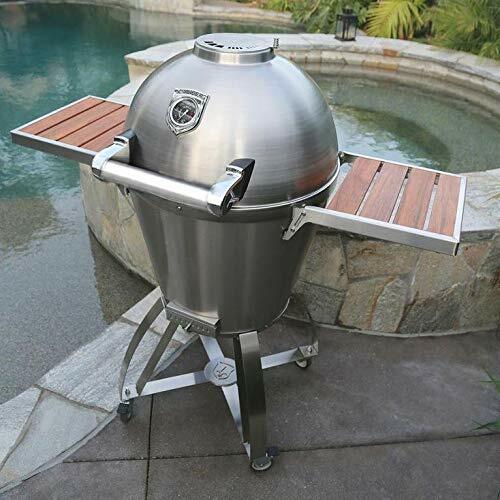 But if I was to be truthful with this top 10 list of best kamado grills, first would be the Classic III, then the Classic II and then Big Joe, Projoe, Standalone Joe and original Joes (probably even the Joe Jr). But that wouldn’t make a nice well-rounded list. So I have chosen the best from each brand. The Kamado Joe Classic III is definitely the standout grill from a company of amazing kamados. And the signature feature for the Classic III is the SloRoller insert. Which is designed for perfect low and slow smoking. The SloRoller uses some magical science developed by some crazy smart people over at Harvard to create heat and smoke cyclones that eliminate hotspots. And as this is the only Kamado with this technology (although you can buy the SloRoller separately for earlier models) you’ll get a better cook when smoking low and slow than with other kamados – due to the even distribution of heat and smoke. Ceramic grills are heavy, and this is often noted when opening the lid. But not with the Classic III, which comes with a counterbalanced air lift hinge. Which means you can easily open the lid with one hand while enjoying a beer with the other hand. The lid also comes with a rainproof vent for those of you that smoke in all weathers. 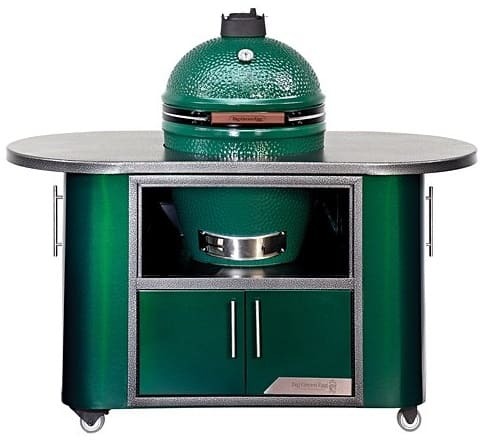 The most iconic of all the ceramic egg-shaped smokers is the Big Green Egg. It was the first company to make kamado grills popular with the American public and therefore has a massive loyal following. Remember, when you buy a good quality ceramic grill, it will last a lifetime. So people don’t often swap and change once they have made their first purchase. Big Green Egg has several sizes, just like Kamado Joe, and it’s most popular model is the Large Big Green Egg. And it’s an amazing piece of BBQ smoking kit. If you have one you will not be disappointed. 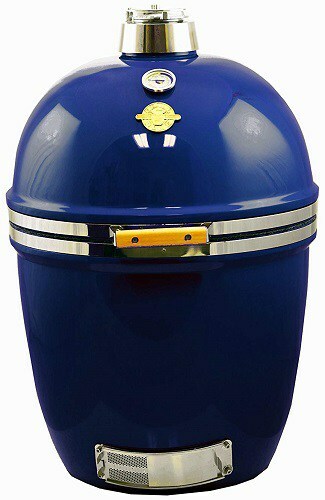 But it is in the same price bracket as the Kamado Joe Classic III and the Classic III isn’t just a ceramic egg. It comes with lots of extras. With the Big Green Egg you’ll need to buy a Cart, side shelves, diffuser plate and grill grates. But some stuff you can’t buy. You’ll not be able to get the airlift hinge or pull out ash tray. So, if you’re about to buy a new Kamado smoker, and although I have ranked the Big Green Egg as second on the list, I’d say it makes no sense buying one. Either get a Kamado Joe or one of the cheaper options I’ll recommend below. 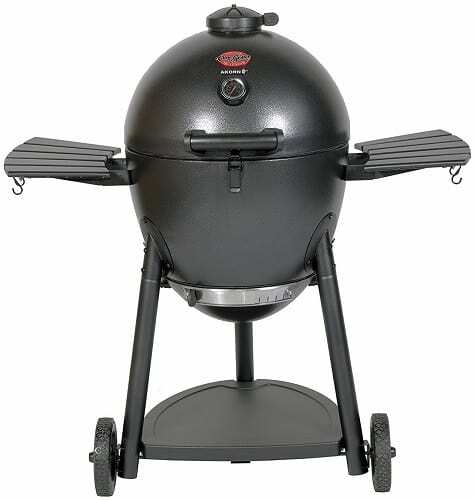 If cost is your primary concern then the Char-Griller’s AKORN is the best Kamado for you. Currently selling around the $300 mark, this Kamado is easily the best for people on a budget. Or for those of you that want to experiment with Kamado cooking before deciding if it’s worth buying one of the more expensive options. So how can one company be so much cheaper than all the other Kamado grills it’s competing against? This great price is achieved by replacing the ceramic dome with an insulated metal dome. A small change like this brings with it pros and cons. The main advantage is obviously the cost. But it also means the whole unit is much lighter and it isn’t brittle like a ceramic dome. You have to say these are great plus points, the trade-off is the durability of the dome. A ceramic dome should last a lifetime. Whereas a metal dome will likely rust at some point so will need greater care and attention. Char-Broil is a big name in the grilling world so it’s no surprise that they have a kamado offering. And as far as kamados go it’s a well-valued grill. 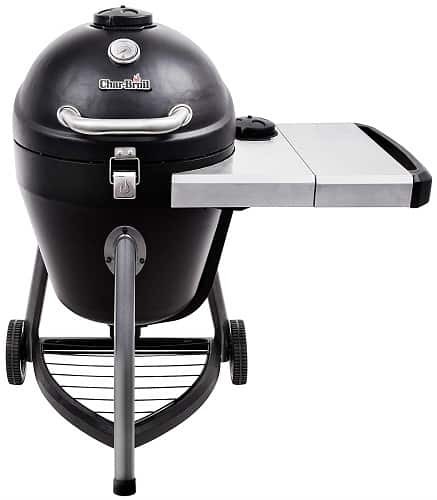 It comes as standard with a three-legged cart and a side tray – which is unusual for a grill in this price range. One of the selling points of the Char-Broil is the top loading ash pan. They say it’s to avoid air gaps that will affect temps. For some people this is a good thing. I prefer a well-made bottom opening ash pan but this addition would come at a cost, and there are plenty of people that prefer the top loading pan. What’s important to one person might not be important to another. That’s how I’d describe one of the selling points of the Primo Oval XL. It’s made in America. Does that make it a better grill? No. Will it make your cooking taste better? No. Will it make it cheaper? No. All this means is you are patriotic and want to support American jobs. Of course, the Primo Oval XL is still a very good Kamado, Primo has many years of experience and loads of happy customers. The oval shape of this grill is different from its main competitors and isn’t just for aesthetics. It also helps with two zone cooking. The longer grill space and divided firebox make it a doddle to have direct and indirect heat. I love the look of the Broil King Keg, maybe because when I see a Keg it brings back memories of some fun times. And although the look of a grill is a factor when deciding the best Kamado grill, it’s not high up on the list. So what else does this beautiful Kamado offer? The major selling point of a Broil King Keg is its portability. You can and should take this bad boy tailgating. Its insulated double walled steel body means you’ll not have to worry about little knocks cracking your dome wide open. Being steel it shouldn’t crack no matter how badly you treat it. And with the simple addition of the Broil King Keg hitch adapter, there is no excuse not to go tailgating – show this beauty off! The Grill Dome is a really good Kamado, one of the early companies that decided to get into this BBQing space. And after just one sentence I find it hard to say anything more about the Grill Dome. And that’s the problem with Grill Dome. It does everything really well but does nothing to stand out in a crowded marketplace. 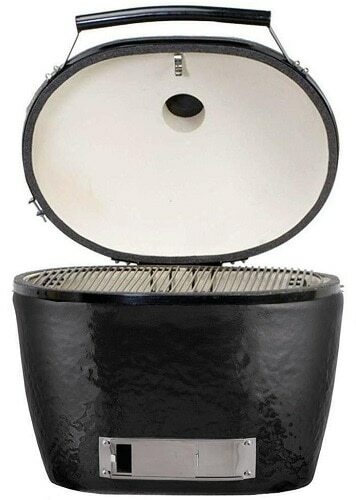 I wouldn’t talk anyone out of getting a Grill dome, the build quality, style and cost are all on par with others. I just don’t know how to talk anyone into buying one. So should it be in a list of the best Kamado grills? Certainly! It’s a top quality Kamado. Vision Grills got a name for itself for being an innovator due to its electric starter port. For some it’s a nice new touch – I just think it’s a bit gimmicky. But when it’s so hard to differentiate one Kamado from another, having a new gimmick is something you need. All other aspects are pretty standard, so I’m not sure why it has this reputation for innovating. It is a quality Kamado in a nice price range, and should probably be known for that instead. A beautiful looking Kamado in the style of the popular BGE and KJ. The big difference being the Blaze Kamado is made from inch and a quarter thick aluminum. And although this alone makes this Kamado stand out, making it from aluminum has given it the ability to improve on a feature where most ceramic kamados let themselves down. The improvement is having a tongue and groove seal between the lid and the body. Meaning no need for the inevitable replacement of the gasket due to wear and tear most kamado users have come to accept. 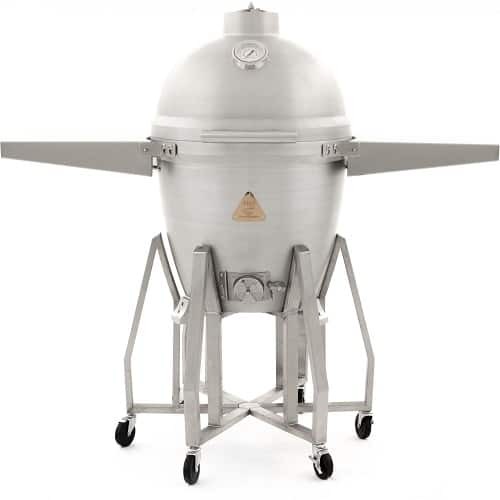 When I first saw the Caliber Pro Kamado I thought, wow, an alien vessel has just landed in the backyard. This space-age look also comes with some great features. The one they seem to be proud of the most is their patent-pending ﬂue-way system. This moves the heat in a circular path before leaving via a vent. The reason for this is for better moisture retention. And the Caliber Pro doesn’t look like a spaceship just for cool points. It’s to aid in temperature control and use less fuel. It is a double-layered stainless steel dome that encloses a middle layer of ceramic insulation. Making it both stronger and lighter than standard ceramic Kamado grills. Another feature I particularly like is the side charcoal cage and rotisserie system. It lets you get the meat closer to the hot coals – another system that is patent-pending. Sweet and tender meat that just falls off the bone while melting in your mouth. If that’s the goal then Kamado smoking is the way to go. This low and slow cooking hasn’t just surged in popularity with backyard BBQ enthusiasts, even wannabe Thomas Keller’s have brought the slow cooker to their kitchens. This is just one plus point, but don’t underestimate the significance of this one cooking style. For this reason alone I’d be happy to buy a Kamado. The quality of low and slow meat completely negates all the minus points I’ll run through in a bit. If you’re a fan of beef brisket, pulled pork or ribs then prepare your mouth for a taste sensation. But of course, there is a negative to Kamado smoking your favorite meat, and that’s it’ll never taste as good again cooked any other way. Still a little bit niche – but Kamado baking will not stay like this for long. And there is one American staple that will see to this – Pizza. Piping hot fresh pizza made with a homemade tomato sauce is simple, yet will be a massive hit at any shindig you throw. For those of you that want to take things to the next level, you can bake your own artisan buns and rolls making your burger and hotdogs the talk of your peer group. The only downside I can envisage is friends that are too scared to invite you to their BBQ due to you raising the bar so high – but for sure everyone will be coming to yours. I saw a quote on a Kamado forum a few months back but can’t remember who said it to credit them. To summarize, they said, “don’t pick a Kamado in a color you like, get one in your kids favorite color because you’ll be passing it onto them when you die”. That sums up the quality of Kamado grills if properly looked after. So although the initial outlay is relatively expensive, you should never need to buy another Kamado. Many Kamado blogging enthusiasts will gloss over this section. They’re so in love with their Kamado that they’ll not hear a bad word said about it without flying into a rage. Don’t fool yourself, I love my Kamado. But I believe there is always room for improvement. I’m sure some people thought the early clay Kamado was the finished article. But thankfully some great minds thought different and moved things forward. This inability to do zonal grilling is often cited as a big negative to Kamado grills. For those unaware, two zone grilling is when your grill is split into two areas with different temperatures. One side of your grill being hot and giving direct radiant heat and the other side being cooler and having indirect convection heat. 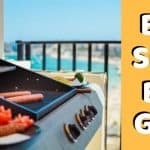 Granted, it’s not as easy to grill in this manner as it is on a BBQ made just for grilling – generally because this type of grill will give you much more surface area to play with. But with the latest advancements in Kamado grilling accessories (heat deflectors and grill expanders) you can defiantly achieve two zone cooking. In fact, you might even get better results on a Kamado than a standard grill of equal size. Normally you’ll only find this being referenced as a problem in older articles written on Kamados or by people not yet familiar with these latest gadgets. I’m not sure if fragile is the right word as the best Kamado frill is built for life. But ceramics are brittle and the sheer weight of the dome means that if dropped, the Kamado is likely to crack open. Obviously once set up, dropping the Kamado shouldn’t be an issue. But you’ll not be able to take it tailgating confidently. As alluded to above, Kamado grills aren’t light. And although several brands come with a wheeled cart for ease of movement, you’re still taking about a 162lb/72kg for the best-selling model, which will be a struggle for the average user to pick up. And as you also know about the brittle nature of ceramic grills it’s probably best that at any time you need to pick it up you make it a two-man job. I’ve seen people use this as a reason to bash Kamados. Do they have a point? Yes and no. Often, Kamado grill sales reps will list the outer shell not getting hot as a great feature, leading people to believe there is no change in temperature. Having your mind conjure up an image of a stick of butter placed on the shell and not melting. This simply isn’t the case and is a little dishonest. What they probably mean when they say this is it doesn’t get scalding hot like a typical metal BBQ. It does warm up considerably. But unless you plan on having your face pressed against the Kamado for an extended period of time the heat given off shouldn’t be an issue. Yes, this is being picky and is not a major issue, but it is an issue nonetheless. Most “sane” people will not want to cook outdoors in the rain. But you do have your committed Kamado smokers that won’t let a little rain stop them. Obviously, they also don’t want rain getting through their air vents. My friend has an amusing setup where he clamps his golfing umbrella to Kamado side tray. Many people seemingly do similar makeshift umbrellas and this hasn’t gone unnoticed. Top vent caps are now available for the most popular Kamados from companies like Somkeware. And as you can see from this forum post, Kamado Joe has even redesigned the top vent to stop rain getting in. Cost is always relative. The best Kamado grill is a quality piece of kit and multi-purpose, so relative to a disposable BBQ it’s going to appear really expensive. And as most people are more accustomed to this lower end of the BBQing scale (as they’ll generally only have one, maybe two BBQ’s a year) they can’t justify the initial outlay of a quality Kamado. And they’d be right. For them, a Kamado isn’t worth it and is expensive. I’m not going to pretend a backyard kamado is for everyone. But for someone that wants to cook quality food outside on a regular basis, I’d say a Kamado is invaluable, and therefore a justified expense and not at all expensive for what you get. A BBQ party you’ll remember for all the wrong reasons. And the ridicule you’ll get at work the next day for rocking the no eyebrows look is not fun either. Flashback is no laughing matter and can be pretty scary when/if it first happens. Thankfully there are steps you can take to minimize flashback – The first step is to understand the conditions that cause flashback. Flashback only happens when you have a fire that’s been starved of oxygen suddenly getting an influx of it. With a Kamado that would mean having the lid and all the vents closed, and then opening the lid. If you’re cooking low and slow or high and fast this shouldn’t be an issue. In fact, flashback typically happens when the cooking has finished and the user is trying to extinguish the flames (by closing everything up and then opening the lid to check on it). So now you’re aware of how it happens, how do you stop it? The best advice I’ve been told is always to approach a Kamado as if flashback could happen and get into the practice of burping it open. To burp a Kamado you’ll have to crack the lid open slightly and hold for several seconds and then slowly open it after this. Doing this will eliminate any possibility of an influx of oxygen. The best kamado grill for me might not be the best for you. Before deciding you’ll have to consider a few points about the grill. These aren’t the only factors, personal taste will play a part as you’ll want your Kamado to be pleasing on the eye, and unfortunately where you are located also plays a part. You’re not able to get every Kamado in all locations, this is especially true if you’re not from the States. Everything in life ultimately whittles down to money. And the sad truth is that not everyone will be able to afford what they deem the best kamado grill. 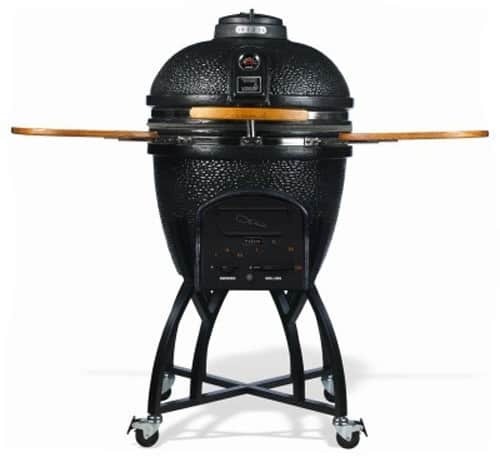 Especially if you fall in love with the 32 inch Big Bad Komodo Kamado or the Kamado Joe Pro – Both well in excess of $5K. So knowing your budget is important. Size isn’t everything, it’s what you do with it, is what people say. And this stands true for your best Kamado grill. Size will dictate how much meat you can cook at any one time, so it is an important consideration. Will you only ever be cooking for you and your partner or will you be hosting backyard parties for the whole neighborhood? If the former then you have the 13-inch MiniMax made by the people at the Big Green Egg, and if it’s the latter you have the previously mentioned 32 inch Big Bad Kamado. And needless to say, many different sizes in-between. There is only so much you can do with a ceramic dome. The quality of the workmanship, the seal and the hinges are enough to differentiate you from lesser models. But if you really want to stand out you need great added extras. Some of these extras are obviously more important to one person than the other, for example, I have a friend that would never get a Big Green Egg because it’s green – the colors of his favorite team’s local rivals. 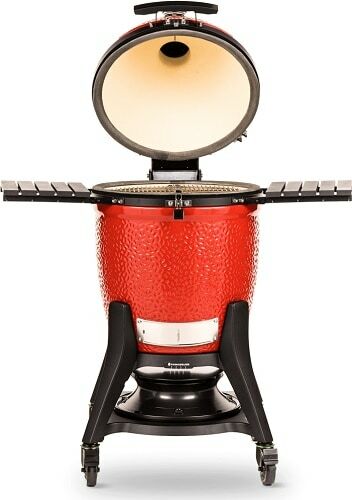 Ridiculous to me, but important to him, and therefore looking at a Kamado from Grill Dome with their option of different colors might suit him. One feature that I think is great is a removable ashtray seen on models for Kamado Joe and Vision Grills. This isn’t going to improve your cooking. But I find I’m lazy at the cleaning up afterward and the ashtray makes things so much easier. And if easy is what you want the Vision Grills ashtray also comes with an electronic starter port. A lot of the features or extras on offer are patented and not available to other Kamado grills so do keep an eye out for these. 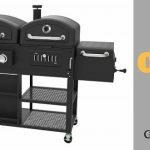 Given two grills of the same size, the price will roughly correlate to the build quality (plus a premium for a top brand name). And although this is more or less true when you’re talking about different models, it’s surprising the difference in build quality when inspecting the same make and model. When reading forums it’s amazing what some people have gone home with. Whether this is a quality control or transportation issue I don’t know. What I do know is you are best served by giving the Kamado a once-over before buying. Check for any cracks or imperfections in the ceramics. As mentioned already, ceramics are brittle and these little imperfections can seriously weaken the whole domes integrity. Making sure the seal seals is another must. You’ll have a never-ending fight keeping temperatures stable without a good seal. In a niche with so many dedicated and enthusiastic followers having a good reputation is essential. If someone is passing off substandard products they will not last long. So be sure to see what others are saying online. But be aware that there is a bit of team rivalry between owners of different brands. Generally speaking though, if a couple of big forums or facebook fan pages are knocking a product you can be pretty sure it’s one to avoid. Seems silly to me to add a warranty to a list when judging the best Kamado grill. But these products aren’t cheap and cheerful disposable barbecues. They’re expensive and should be well crafted. The warranty the maker is willing to offer normally tells a story of how confident they are in their product. As most people buy a kamado to use as a smoker or outdoor oven, which can be purchased individually a lot cheaper in non-kamado style, you’d like to know that the extra expense of the multi-purpose cooker is worth it. Are you buying quality? The warranty should tell you this. Accept nothing less than a lifetime warranty on the ceramic egg/bowl/dome as this is now standard for major players that believe in their Kamado. A Kamado isn’t made up solely of ceramics so be sure to look at the warranty for other parts such as metal or cast iron parts. You should be looking for at least 3 years here. Warranties are also offered on accessories such as pizza stones. Obviously, this isn’t as important but does give you peace of mind when buying. When choosing the best Kamado grill for your needs, you may need to look into the accessories needed for the cooking styles you enjoy. Some Kamado accessories are interchangeable between different brands of Kamados (and even other types of BBQ’s). But some are made specifically for just your grill. So you’ll need to investigate whether you’re able to buy the accessories you need. If you want to channel the self-basing powers of spit-roasted meat then you’re gonna need a Rotisserie. And rotisseries aren’t interchangeable, you can’t move them between different Kamados or BBQ’s. So if you like spit-roasting make sure the Kamado you buy has a rotisserie accessory. I love pizza and having mentioned it a few times in this article, I’ve come close to scrapping this article in order to go make myself a nice homemade pizza. Thankfully I’m nearing the end of the best kamado review so I’ll struggle on. There isn’t much between one pizza stone to the next (thicker ones are probably better). All that matters is does it fit your kamado? You do have to be a little bit careful with them though. You can’t put a cold stone into high temps, or a hot stone on a cold surface without a risk of them cracking. The LavaLock Baking stone is a great option. Not so much an accessory, more a necessity. You’re not going to be doing much cooking if you can’t get your coals hot. So what are the options? I use a blow torch and a chimney starter, this is super quick. But I’m going to write an article on all the methods for starting your BBQ, so if there isn’t a link here that means I haven’t written it yet. With most Kamados you’ll get a traditional stainless steel grate. But there are several other great surfaces to cook on. So look to see which ones you like cooking with and see if they are available for your choice for best kamado. Cast iron grate for them mouth water inducing sear lines on meat. Flat and ribbed cast iron griddles. If you want to get the best out of your fish then look for a stainless steel smooth surface. And last of the popular cooking surfaces is the Soapstone, a thick bacteria and stain-resistant slab that’s great for cooking meat in their own juices. Not sure if I’ve mentioned it already, but Kamado grills are heavy. And some are extremely heavy. So unless you are mister muscles you’ll need a Kamado that comes with a cart. Not only are these cart used for moving the kamado around effortlessly, but they also raise the grilling area to a more comfortable height. This can benefit you as you’re not hunched over all the time. The vast majority of people will be more than happy to just have a standard table at the side of their Kamado. But there will be a few of you that would like a table specially made to fit a Kamado. After all, these do look a little bit cooler. So what are your options for a Kamado table? A very popular option is to build your own table. It seems BBQ people are very hands-on types and are happy to give this relatively easy bit of DIY a go. Some do this simply by cutting a Kamado sized hole in a table they already own. But the more adventurous DIY’er will make one from scratch. Now, although this is a great option I’d only recommend it if you already have the tools to do a job like this. Otherwise, it will be far more expensive than the next two options. Why not have a Kamado table custom made for you. This is the sort of job any carpenter should be able to do in no time at all. You can look locally for such a person or you also have people that offer Kamado tables as something they specialize in. Two such companies are Brian Alan Tables and Wood By Dana. The above two methods of getting yourself a Kamado table are great for giving you the flexibility of having the style and layout that you want. But if you are new to Kamado grilling you might not have a preferred layout. If this is the case, or you just want a lazy option, then you can buy one of the generic tables offered by some companies. Often the best option is available from the company of the brand of Kamado you have. A small word of warning now. If you are going to make your own table, or even for some tables made by Kamado manufacturers, you’re going to need a table nest. If not your warranty might be void. Because Kamados can get hot, especially at the bottom, placing them on any combustible surface is extremely unwise. Your table nest can be in the form of small legs that lift the Kamado off the surface, like that made by the people at the Big Green Egg (this table nest will also work with the Kamado Joe). A sturdier option, as these legs aren’t the strongest, is a table nest sold by Innovations by Chance. But for me, the best option is to get a nice slab of concrete or granite from a hardware store (make sure this is at least 2 inches thick). Above we have updated this best Kamado grill. But for those of you that are interested in our old review, to see how the Kamado smoker niche has progressed in such a short time, we have decided to leave what we had previously written. This will all be highlighted in blue. There comes a time in every budding pitmaster’s life when they look to get involved in the increasingly popular kamado style of barbecuing. 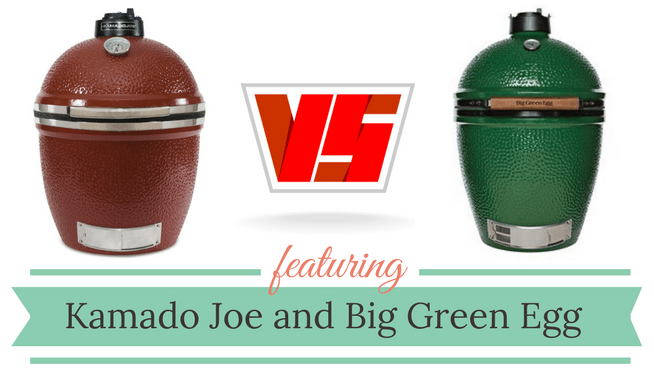 And as sure as eggs is eggs they’ll ask the inevitable question of which is better, Kamado Joe or Big Green Egg? A straight fight between the late to the party upstart and the old stalwart. I’m going to guess the title of the article has given the game away a little on which kamado I’m leaning towards. But let’s see the Kamado Joe vs Big Green Egg battle play out by running through all the pointers outlined above and a few additional issues that helped me place the Kamado Joe in the first place. When two heavyweights come head-to-head it’s always entertaining to look into the back story of the two opponents. The Big Green Egg story deserves to be told first. This is the company – run by ex-serviceman Ed Fisher – that brought Kamado cooking to the masses. Without the hard work and innovation of Ed Fisher it’s likely there wouldn’t even be an enthusiastic Kamado smoking and grilling community. It all started back in 1974 when Ed opened his first store, primarily to sell Japanese pinball machines. But he also shipped in clay cookers due to the nostalgia he felt for these cookers from his time spent overseas. The taste he remembered was so much better than anything he could recall having on a more traditional BBQ. It was on this simple whim that an industry giant was created. Many years of research and development later, and of course the addition of a cool new name, a clay cooker became a big sturdy green ceramic egg. With a spring assisted opening hinge, patented vent cap and draft door, stainless steel components, a cart, and a hard coat porcelain glaze – completely unrecognizable to the original imports. The Big Green Egg not only became a market leader, it was the whole market. But this wasn’t to last long, and as they stood still enjoying their success, it gave an opening for newcomers to join the party. Enter the Kamado Joe. The year is 2008 and a Kamado aficionado, Bobby Brennan, has decided he can take the kamado to the next level. I have heard the rumor many times that Bobby Brennan use to work at BGE and took his knowledge of how things worked there to his new company. But I see no online reference to him ever working for them (maybe if Bobby finds himself reading this he can put that rumor to bed). What is for sure is he loved the Egg, as the launch of the Kamado Joe was originally ribbed for being a red BGE because of the similarities. A red egg wasn’t going to be enough to compete with an established BBQing favorite though, and Bobby Brennan knew this. And being the hungry new company they knew the only real way to differentiate themselves from the original was to innovate and give better value. And as you’ll find out below they have defiantly achieved this goal. If you’re part of the mythical 1% club I hear don’t care about money due to having what seems an unlimited supply of the stuff, then round 1 is meaningless to you. Maybe it’s the social circles I hang with. But with everyone I know, price is a major factor in any purchase. So which of these two popular Kamado grills is cheapest? Unfortunately, such a simple question doesn’t have a simple answer. You’ll hear people argue both grills are cheapest. How can this question be in dispute? It’s all to do with how each sells their products. BGE will sell you just the Kamado and you have to buy all your accessories separately. Whereas KJ sells an all-inclusive package. So for the initial outlay on the Kamado, you’ll find the Big Green Egg is generally cheaper. But once you add the cost of accessories needed (and that come as standard with the Kamado Joe) you’ll see a considerable difference in the KJ’s favor. These two pricing strategies are why people can argue either side. Often diehard fans of the Big Green Egg will say the Egg is cheaper. This is because they already have the accessories and don’t need to buy them separately. These Egg Heads (the affectionate name for fans of the BGE) always look on the Egg with rose tinted glasses. The truth is if you are new to Kamado grilling, buying the Kamado Joe is by far the cheaper option. There is nothing between these two grills when it comes to size. They both have a small 13-inch grill, an 18-inch grill (which is the best seller for both brands) and a massive 24-inch Kamado. So both brands score highly on this front. This is where the Kamado Joe comes into its own. There are two features that stand out for me, as these aren’t available for the Big Green Egg. Their patented slide out ash drawer that makes cleaning so much easier is a favorite among many people that made the switch from BGE to KJ. It’s the kind of feature that seems so obvious once you use it. You have to wonder why it wasn’t always a thing. For the people that love to grill, Kamado Joe has brought to the market something they call the Divide and Conquer cooking system. I love the name, but it’s the added functionality this added extra gives you that’s made it a hit with Kamado lovers everywhere. Again this is a patented bit of kit so not available on the Big Green Egg. What it does is it allows you to two zone cook. It’s a half rack, two-level cooking system, which allows you to get one-half of the grill down lower to the coals. Innovation – Now this doesn’t sound like an added extra as it’s not a physical entity, but this is a very important extra. Is the company you’re buying from looking to innovate? Well, the answer is a resounding yes from Kamado Joe. They are now the company that is trying their hardest to push the Kamado to new levels. And you know if you buy a Kamado Joe that the new innovations in Kamado cooking will likely be coming to the KJ first. The Big Green Egg on the other hand just seem to be stagnating, yes it’s still a great bit of kit but the buzz about future developments just isn’t there. Both Kamados domes are made of high-fire ceramics with a hard coat porcelain glaze and are both of top quality. The Kamado Joe is a little thicker though. This doesn’t affect the cooking in the slightest. But it does mean the outside will be cooler to touch. So nothing to really separate them on this front. But the standard gasket and temp gauge that comes with the Kamado Joe is better, just edging them out in front for this round. Online reputation has Big Green Egg out in front, they have a massive fan base and a very active forum community, all willing to help with new ideas. Of course, BGE has been available much longer than the KJ, so this is to be expected. But with the Egg still selling roughly four products to KJ’s one, this isn’t likely to change anytime soon. As for the reputation of customer service from the two products, the Kamado Joe gets glowing reviews from people that have needed them. This isn’t always the case with people having issues with BGE. And what is a surprise from any company, not just Kamado companies, is that the owner of KJ is a very active community member of both forums and facebook fan pages. Yes, sometimes it’s to plug new Kamado Joe features. But often it’s just to reply to queries or join a conversation. It’s for this reason, I think Kamado Joe always seems to have their finger on the pulse of the user’s needs when it comes to innovating. You get a quality, worry-free warranty with both these Kamados. A Lifetime warranty on the ceramics and 5-year warranties on metal parts. These two Kamados have also sold so many units you’ll be pretty confident you’ll not need the warranty, any issues would have been ironed out long ago. Another issue with the Big Green Egg that’s not something you’ll normally judge a product on is it’s not currently available to buy online. This has probably saved a mailman or two a hernia. But it’s not great for the average modern day consumer. We want what we want, and we want it within a few clicks of our mouse. The Kamado Joe, on the other hand, is available through several online outlets. All this leads me to say I think the Kamado Joe is the best Kamado grill currently available. Whether or not you agree with what I’ve said above (I understand some people will see things different and other things are a personal choice, not scientific facts) you can see how I have arrived at my decision. And you can do the same to find the best Kamado to suit your needs. Is having the KJ top of the pile a controversial choice? Maybe, and a few years back I’m sure I’d get a lot of abuse for making this claim. But at the time of writing this, even some egg heads will begrudgingly admit the Kamado Joe is the better option. And at the time of you reading this article it might be that the KJ is the clear winner, as they’ll soon release a new and improved 2017 model. What are these new features? Well as luck would have it, a few hours after starting this “Best Kamado Grill” article, Bobby Brennan posted the following on Facebook outlining how the new Kamado Joe is better than the Big Green Egg – and also threw in a little sucker punch at the end (last of the boxing analogies, I promise). Hinge………you have to feel the difference. Many people state the Komodo Kamado as the best looking Kamado available. I personally don’t see this, but beauty is in the eye of the beholder. One thing that is for sure is it does have a distinctive look. So if you’re looking for something different this could be the Kamado for you. Why is this Kamado in the top 10? Well, that’s all to do with build quality. The Komodo Kamado is probably the best-built Kamado available. All metal components are laser cut 304 stainless steel. It has a spring-loaded lid, heavy-duty rubber wheels, a removable charcoal tray, and the piece de resistance – the tiles bonding agent is similar to what NASA uses for heat tiles in their space shuttles. All this sounds amazing, but it comes at a cost. The Komodo Kamado is super expensive when compared to other brands (the 23-inch grill is about $4,400 and the 32-inch version is just over 6K). Is this extra quality worth the extra expense? I’d have to say no, but I’m not on a superstar footballer salary. And it’s a football player you’ll need to be if you plan on moving this Kamado about.. All this great engineering means the Komodo Kamado is extremely heavy. I’ve been smoking food for years now, having started with the Egg and then buying the Joe. I’m in agreement that the Kamado Joe is the slightly better option. I wouldn’t admit that to my friends though as they’re serious egg heads. 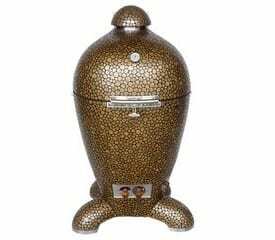 I am trying to decide between the Big Joe and the Blaze Kamado. I plan to cook a large variety of meals with whichever Kamado I go with. I had my mind set on the Blaze Kamado but am slowly starting to like the Big Joe. One reason is size. I’m a little worried about having enough space in the Blaze for a large brisket. I know there is a video that shows Chef Tony with BBQ GUys smoking a brisket but he does not say what size the brisket is, only mentioned it was 16 lbs. My reservation about the Big Joe is cracking. Thoughts?